A pregnant Memphis, Tenn., woman says she was pepper-sprayed and thrown to the ground by an apartment-complex security guard. According to Fox 13 Memphis, the woman, Camri Denton, who says she is two to three months pregnant, and her family were helping their mom, whose Bent Tree apartment had caught fire. Denton told the news station that security was instructing her to leave when she told them that her name was on the lease. "My name is on the lease. So I don't have to leave," Denton can be heard telling the guard in video of the incident. "I don't have to leave. My name is on the lease." "Ma'am, you are causing a riot out here," the guard answers. "You are causing people out here to act crazy." Denton told the news station that one guard grabbed her wrist "and they slammed me against the wall. They put me in handcuffs, and the female pepper-sprayed me." Denton’s father, Andre Buford, added: "I mean, I don't understand how security is able to get away with things like this, especially when your job is to secure the problem, not cause problems." The family told the news station that they have had several run-ins with these guards before, but nothing this violent. Fox 13 contacted the apartment complex to find out about the incident and got referred to the Cobra Memphis security company. 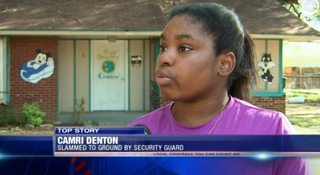 Cobra Memphis told the news station that it doesn't provide security for the Bent Tree Apartments.